TUCSON – National Guard UH-60 Blackhawk helicopters participating in Operation Guardian Support arrived last month to assist Tucson Sector Border Patrol agents with transport capabilities in remote, rugged areas of southern Arizona. 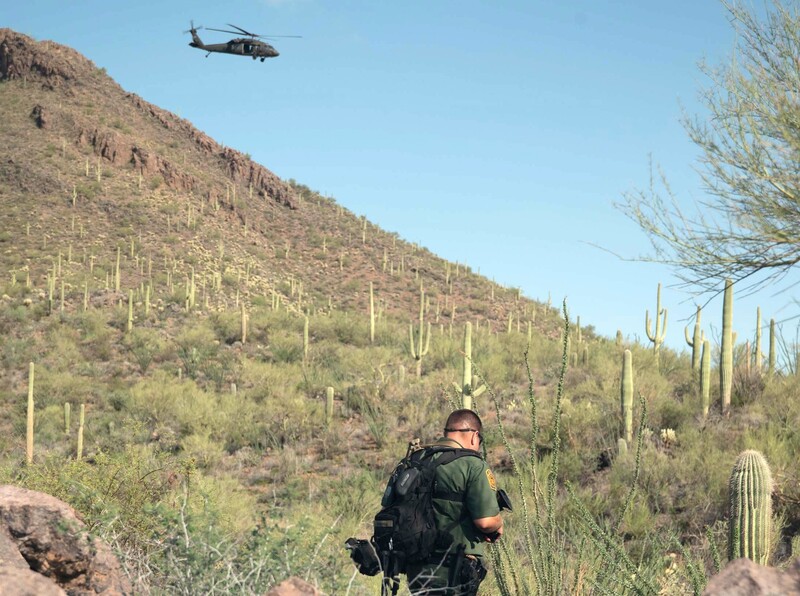 The Blackhawk crew inserted Border Patrol agents and a canine into a remote area southwest of Tucson where agents were able to rapidly deploy to apprehend two Guatemalan nationals attempting to evade arrest. The two men, ages 19 and 23, were dressed in camouflage and carpet booties, items often used by illegal aliens in an attempt to avoid detection. Both men, previously removed, now face criminal prosecution for illegal re-entry. Tucson Sector agents are responsible for 262 linear miles of the Arizona border with Mexico. The vast desert environments and rugged mountainous terrain creates a challenge for agents on foot. Assets, such as the OGS aerial transport capabilities, serve as additional resources vital to border security.